Your daily mission: secure a close shave. 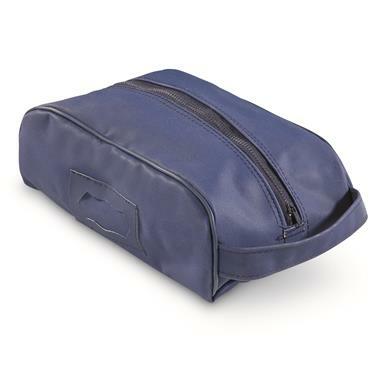 Look first class for less by storing your shaving and toiletry essentials in this Italian Air Force Issue Shaving Bag. Open the center zipper and find plenty of room for all the essentials you need to be cleaned up and ready for daily inspection. Vinyl construction makes the bag water resistant and easy to clean, inside and out. Strap handle at the end makes it easy to carry or hang up in tight quarters. The ID tag window on the side lets others know this is the exclusive property of the well-groomed. Dimensions: 8.5" x 5" x 3.5" h.
5.5" x 4.5" x 3". Handy hauler for small essentials. XL-sized for your larger-than-life activities. 2-pc. system provides military-grade warmth.